VGN has the hottest Americas Card Room Signup Bonus around. Only through VGN will new Americas Card Room players get the best signup bonus that the internet has to offer. Please keep in mind that this signup bonus can only be used if you are a new player without an account on Americas Cardroom. If there are any questions about this or any other poker signup bonus please contact VGN Live Support. This bonus will get you setup with Americas Card Room award winning Elite Benefits Program. Not only will you start earning through their awesome elite benefits program but you also get a whole bunch of stuff from ACR & VGN just for signing up for ACR through VGN Poker. If you have any questions or need any help with this bonus please feel free to contact VGN 24/7 Live Support. We are open 7 Days a week and are here to help you with any problems and/or questions you may be having about any offer or information you see on our website. Good Luck & Good Games!! See you all on the felt! 1.) 100% Match Deposit Bonus up to $1,000.00! 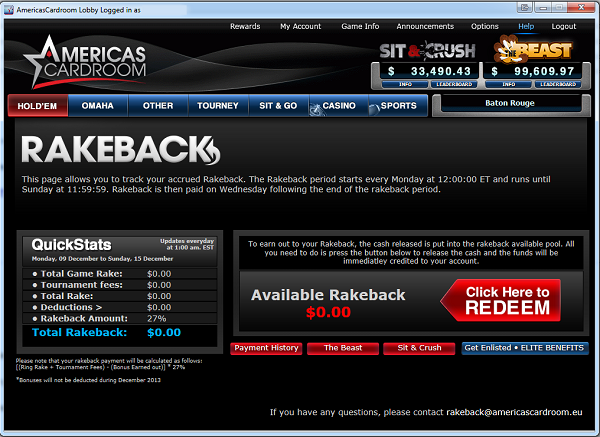 Just by signing up for Americas Cardroom through our site you will receive and awesome 100% Match Bonus up to $1,000 after your first deposit if you use our Americas Cardroom Bonus Code: jimpoker when signing up. Click Here To Signup. You can’t go wrong with a little bit of free money. Signup for Americas Card Room through VGN and we are offering Exclusively on VGN a no deposit bonus. For a limited time, New Players who signup through VGN will receive 20 Days of Free Cash up to $50.00. Usually we will deposit your $5.00 No Deposit within a day or 2. But sometimes it can take up to 2 weeks. If you haven’t received your bonus within 2 weeks of Registering through our site please contact VGN Poker Support.